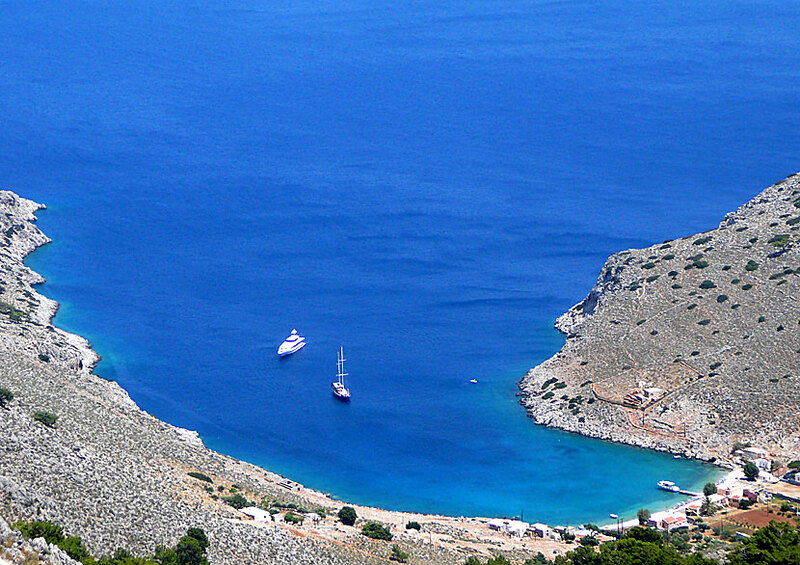 Marathounda is my favourite beach on Symi. 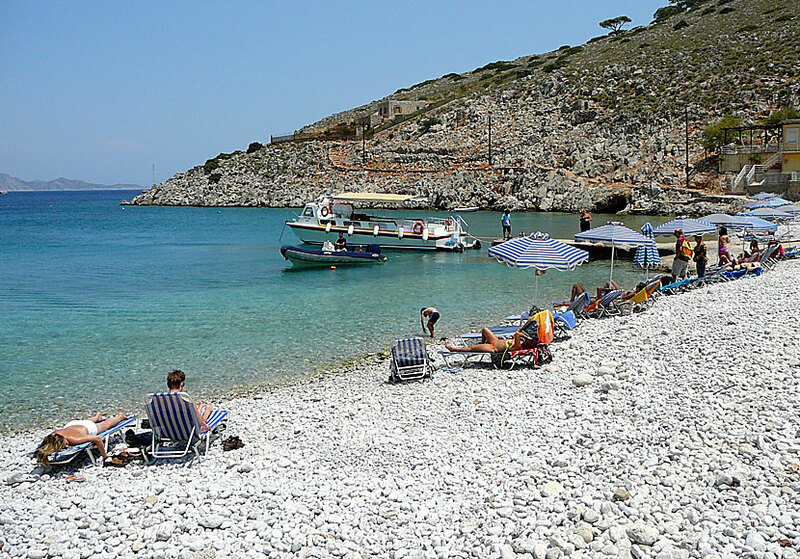 The beach is pebbled, just like many other beaches on the island. There are two reasons why I like this beach so much: it has a beautiful location (that I appreciate) and a nice crowd of refractory and pretty funny goats are living on the beach. 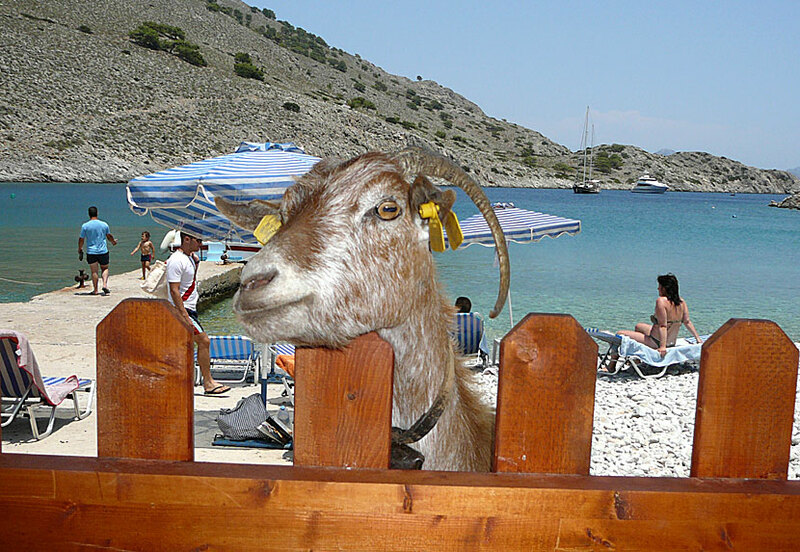 So if you like the combination of pebbles and goats, you should immediately go to Marathounda beach. One of many curious goats on Marathounda beach. The goats are as domestic as goats can become, and they do everything they can to steal food from us poor tourists. The only taverna is fenced in by a high fence to stop the goats from entering. It helps so-so. Part of the pebble beach of Marathounda. The goats are incredibly creative and they usually manage to steal food anyway. Many guests - including myself - think it's fun, and they happily feed the goats. The beach then? Well, it's great if you like pebbles. An extra plus since the taverna serves so delicious food. Marathounda is located about 18 kilometres south of Gialos. You get here with your own transport or by beach boat. View of Marathounda bay. The picture is taken from the winding road that leads down to the beach.